It has been almost 3 weeks since my last post. A family emergency of the “drop everything because someone needs you right now” variety came up and I flew out to California to support my sister while her husband was in the hospital. Although the circumstances that took me to California were sucky at best, there was a silver lining. Besides my brother-in-law being on the road to healing, I got to spend a lot of time with both my sisters who live in Los Angeles. I normally only get to see them for a few days around the holidays so being able to spend two weeks with them was a gift. And I had lots of time to cook for everyone. I’m not great at knowing what words to say when someone needs emotional support but I can feed them well. I am a firm believer that nourishing the body nourishes the soul. Now, what does all of this have to do with panko crusted shrimp? Only that food can feed us on many levels. And that I am so grateful to have you guys reading and supporting this blog and giving me another outlet to share good food. It nourishes my soul. So, let’s move on to what you should make for dinner. 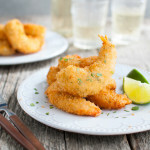 How about some wine battered panko crusted shrimp? The wine adds some zing and the panko breadcrumbs add some always loved crunch. Be sure to press the breadcrumbs on to the shrimp to help them stay on. That way you will get a beautifully crispy shell when you fry the shrimp. I used large shrimp for this recipe because I prefer to peel as few shrimp as possible but you could easily go with a smaller size. Toss a light salad for a side and you’ve got dinner. However, I might be tempted to batter and coat some asparagus and fry it up along with the shrimp. Because why have only one fried item when you could have two. In a large bowl, whisk together the flour, wine, cilantro, salt and pepper until smooth. Let sit for 10 minutes to thicken up slightly. Place the flour for dredging in a shallow bowl or plate. Place the panko bread crumbs in another shallow bowl or plate. Pour oil into a large skillet to a depth of 1/4 inch and heat until hot. While the oil heats, prepare the shrimp. Dip each shrimp in the flour, shaking off any excess. Then dip it into the wine batter allowing any excess to drip off. Then coat shrimp in panko bread crumbs pressing on crumbs to help them stick to the shrimp. Fry the shrimp in batches, until golden brown all over. Drain on paper towels.